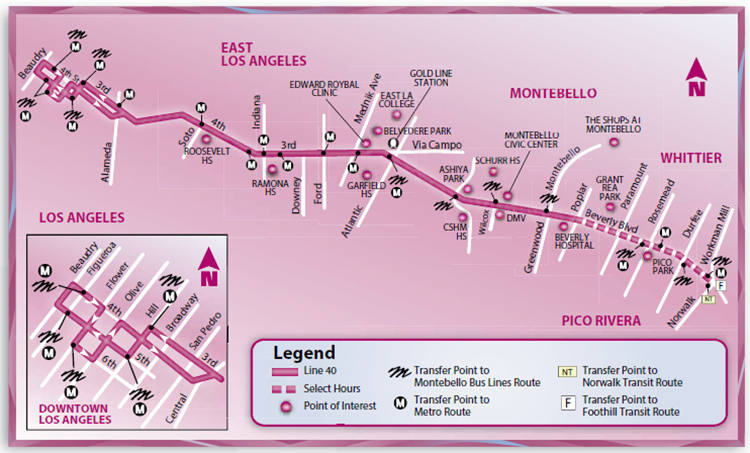 Line 10 is a local route that operates between East Los Angeles College in the City of Monterey Park and the Whittwood Town Center in the City of Whittier primarily via Atlantic Boulevard and Whittier Boulevard. A short-line turns around at the Pico Rivera Terminal located on Passons Boulevard. 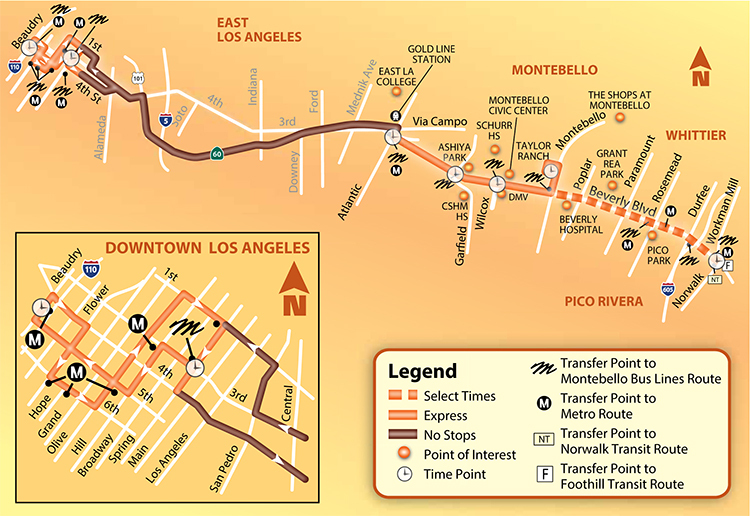 Major destinations and shopping centers on this route include the East Los Angeles College, Garfield High School, Montebello High School, downtown Montebello, Pico Rivera Plaza, Whittier Marketplace, Whittier College, downtown Whittier, the Quad at Whittier, Whittier Hospital Medical Center, and the Whittwood Town Center. Line 10 provides weekday and weekend services from approximately 3:30 a.m. to 11:30 p.m. Peak headways on this route vary between ten to fifteen minutes. 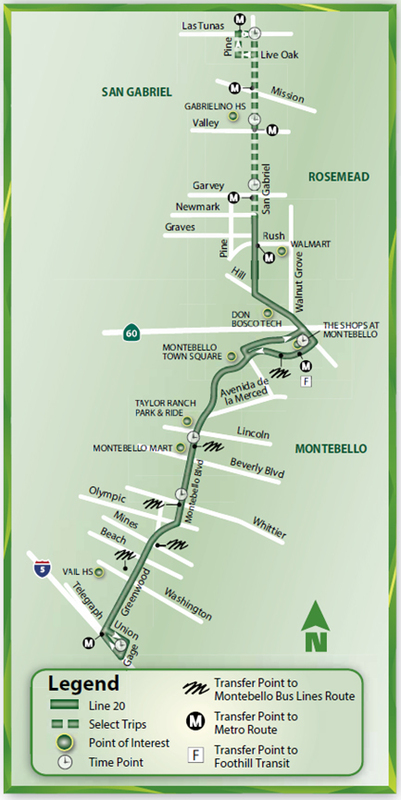 20 is a local route that operates between the City of San Gabriel and the southern boundary of the City of Montebello via San Gabriel Boulevard, Montebello Boulevard, and Greenwood Avenue. A short-line turns around at San Gabriel Boulevard and Garvey Avenue. Major destinations and shopping centers include downtown Montebello, Montebello Mart, Montebello Town Square, The Shops at Montebello, Don Bosco Technical Institute and Gabrieland High School. Line 20 provides weekday and weekend services from approximately 5:30 a.m. to 11:00 p.m. Headways on this route are consistently fifteen minutes all seven days per week. 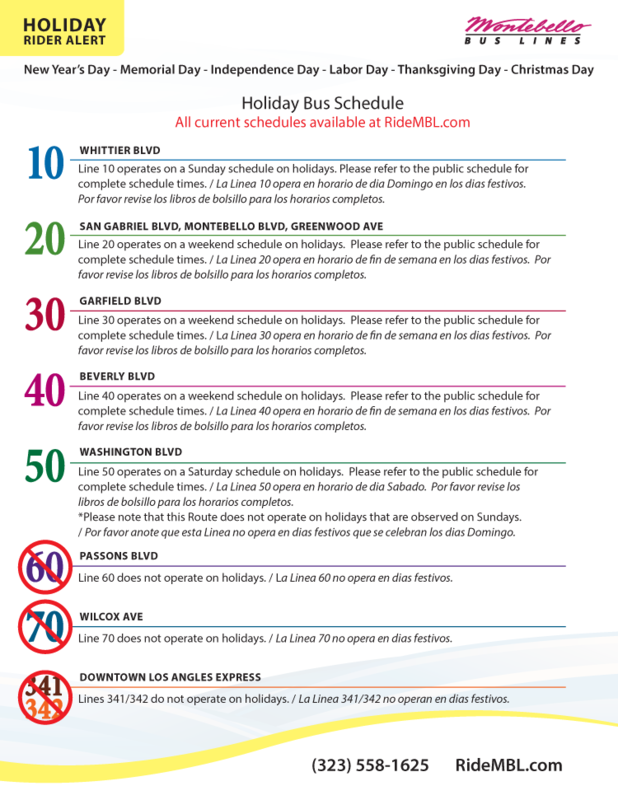 Line 30 is a local route that operates between Huntington Drive and Stoneman Avenue in the City of San Marino; and Garfield Avenue and Firestone Boulevard in the City of South Gate via Garfield Avenue. 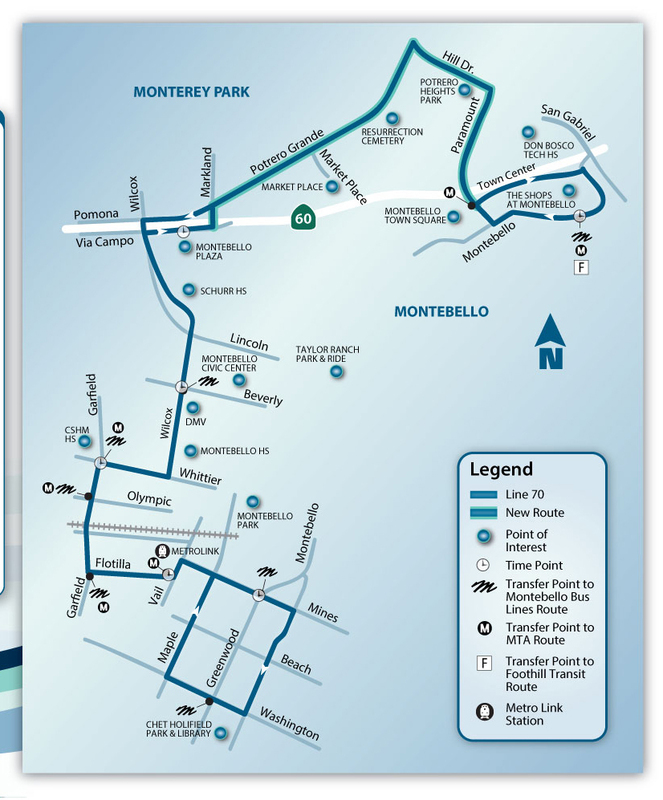 In 2001, Montebello Bus Lines assumed operation of this service after LACMTA cancelled their Line 262. Major destinations and shopping centers include the Alhambra Civic Center, Garfield Medical Center, Monterey Park City Hall, Cantwell Sacred Heart of Mary High School, LA County Department of Public Social Services, Vail High School, Commerce Metrolink Station, Bell Gardens Civic Center, and South Gate Town Center. Line 30 provides weekday and weekend service from approximately 4:45 a.m. to 10:30 p.m. Weekday headways on this route are forty-five minutes and hourly on weekends. Line 40 is a local route that operates between the City of Whittier and Downtown Los Angeles. 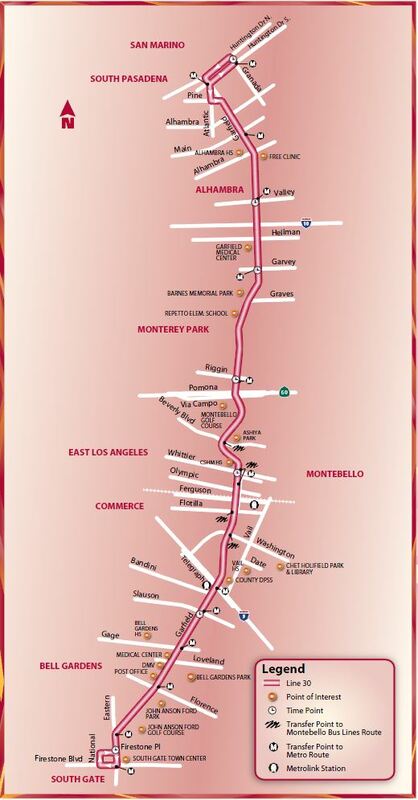 This route primarily travels on Beverly Boulevard, 4th Street and 3rd Street. A short-line turns around at the Grant Rea Park in the City of Montebello. Major destinations and shopping centers include the Beverly Hospital, Montebello Mart, Montebello Civic Center, Montebello Library, Department of Motor Vehicles (DMV), East Los Angeles Civic Center, Roybal Health Center, Roosevelt High School, and Downtown Los Angeles. Line 40 operates seven days a week from approximately 4:45 a.m. to 11:00 p.m. Peak headways on this route vary between twelve to fifteen minutes. Line 50 is a local route that operates between the City of La Mirada and Downtown Los Angeles primarily via Washington Boulevard. Major destinations include Downtown Los Angeles, Pershing Square, industrial areas in Los Angeles, Vernon, and Commerce, Commerce City Hall, Pico Rivera Town Center, Santa Fe Springs Town Center, Presbyterian Inter-Community Hospital, Whittier Union High School, Whittier College, Whittier City Hall, The Quad at Whittier, Frontier High School, California High School, Biola University, La Mirada City Hall, and La Mirada Town Center. 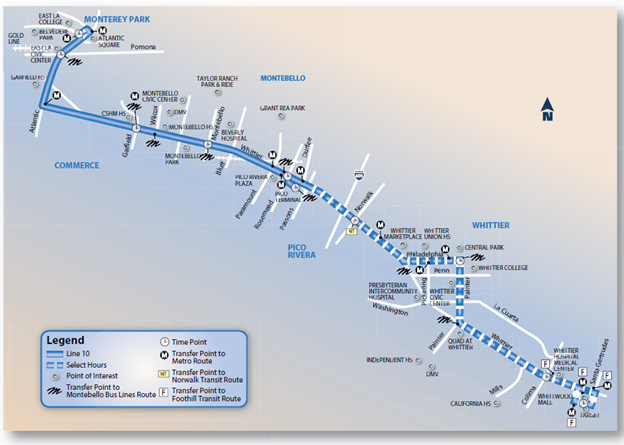 In 2000, MBL assumed this route after LACMTA cancelled contracted service on their Line 105. Line 50 operates weekday and Saturday service from approximately 4:30 a.m. to 11:15 p.m. Weekday headways are thirty minutes and hourly on Saturday. Line 60 is a local route that operates north and south in the City of Pico Rivera primarily via Passons Boulevard. Major destinations and shopping centers include the Pico Rivera Plaza, El Rancho High School and Pico Rivera City Hall. Line 60 also travels through residential areas. Line 60 provides weekday services from approximately 6:00 a.m. to 7:00 p.m.; weekday headways average thirty-five minutes. 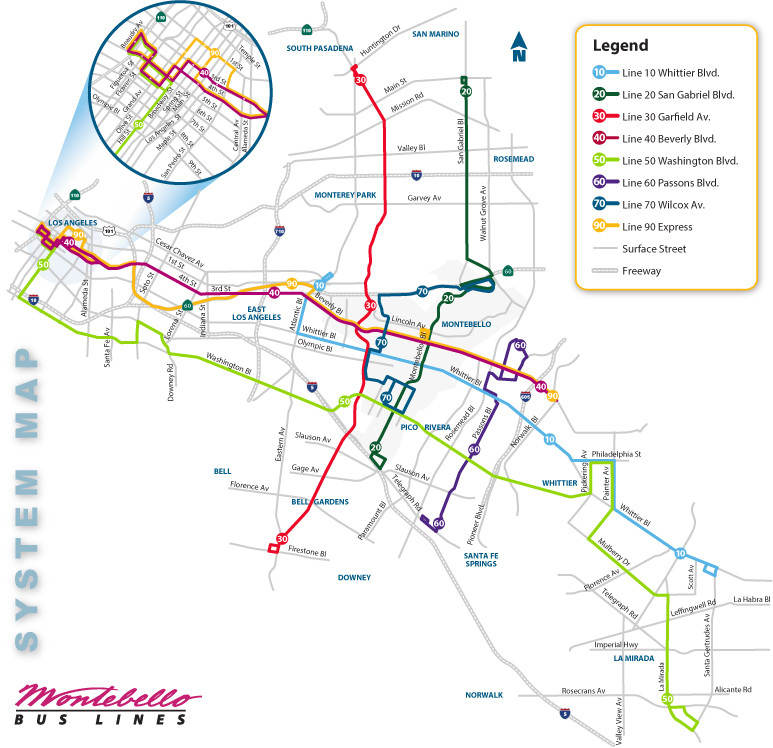 Line 70 is a local route that operates north and south from the Montebello Metrolink Station to The Shops at Montebello within the City of Montebello. Major destinations and shopping centers include the Montebello Metrolink Station, Chet Holifield Park Library, Montebello High School, Schurr High School, Montebello Plaza, and The Shops at Montebello. Line 70 also travels through residential areas. Line 70 provides weekday services from approximately 5:30 a.m. to 7:00 p.m. Headways on this route are thirty minutes. Line 90 Express operates weekday services from approximately 8:00 a.m. to 5:00 p.m. Weekday headways are thirty minutes. Express Lines 341 / 342 has been renamed to Line 90 Express.